The process will deflect money and human resources away from the disruptive innovations that power future growth." The Innovator's Guide to Growth. Vern Burkhardt (VB): What advice do you have for those who read books that say innovation is random and requires creative genius? Mark Johnson: It may be true that innovation needs people to be able to come up with different ideas within some degree of chaos. But innovation is still a process and it can be developed and managed. It may not have the tightness of, say, a manufacturing process, with all the metrics that go along with trying to tightly control the various components. But innovation can still be done in an orderly way, even if it's more organic and less mechanistic than a manufacturing process. VB: What is the innovator's guide to growth? Mark Johnson: Our book, The Innovator's Guide to Growth, aims to give the readers a common language to talk about innovation, and a common way to frame innovation. In the book we lay out the different elements of the innovation process and the various aspects you need to think through so you can successfully innovate to grow. We provide tools and techniques for each different step of that process. VB: Would you talk about the "growth gap" many companies experience, and the role disruptive innovation can provide in closing this gap?" Mark Johnson: We believe that companies can continue to innovate their core, and also leverage their existing business model to move into adjacencies. But any business unit – and, in fact, any business – can only grow so much within a certain market with a certain way of doing things. Eventually, if it wants to continue to grow, it's going to need to do something else – go into a whole new market or transform an existing one in a fundamentally different way; it's going to need a whole new business model. The work we've done with our clients demonstrates that companies are much more likely to be successful creating new growth using a disruptive approach. VB: "Disruptors redefine the notion of performance by pulling overlooked innovation levers. Simplicity. Convenience. Accessibility. Affordability." Or customization. Why is it that most large businesses can win at introducing incremental innovations to existing products, but very often cannot pull these levers to engage in disruptive innovation unless they create separate growth businesses or internal groups doing skunk works? Mark Johnson: There are a couple of reasons. The first is that a company running a successful business model is optimized to run that model through a very effective network of explicit metrics, rules, and implicit norms. It's very hard for a company optimized to do one thing to at the same time be optimized to do something else as well. But, second, even if when executives recognize that they need to develop an entirely new way of doing things, they don't have a process in place to do that. It's important to distinguish between product innovation and business model innovation in this regard. Some of the most radical product innovations might fit within a company's existing business model. When that happens, resources will likely be allocated. But resources likely won't be allocated if the innovation doesn't fit with the current business model – that is, with the way the company currently turns a profit, how it views and measures its interactions with customers, and how it integrates its different activities and functions. That will seem very risky, and the company won't have a process for deciding how to proceed. At the end of the day they won't allocate resources in dollars and time to make a potentially new disruptive effort actually get off the ground. VB: Is having too many innovation projects running simultaneously in an undisciplined manner a common problem with companies – "letting chaos reign?" Mark Johnson: Absolutely. It's hard for companies to understand what their capacity is for innovation to the same degree, for example, that they know their capacity for manufacturing. We have found in practice what academics have confirmed in research. Companies have way more innovation projects than they have resources to develop and manage them. The result is stagnation. People are trying to do too many projects at once. Doing many things means none of them is done very well. None of them receives the focus and energy needed to get to the level they must reach to become viable growth businesses. VB: They're running madly off in all directions. Mark Johnson: Exactly. What is most difficult is trying to do your day job and incrementally innovating to improve the core business, while also being asked to create something new – something that might require a new business model. These are such different disciplines and skill sets that asking one individual to do both at the same time never works out. VB: "…it is not your strategy that determines how you allocate resources; rather, it is how you allocate resources that determines your strategy." What lessons can we draw from this observation? Mark Johnson: It goes back to our discussion about disruptive innovation. In order to avoid being disrupted by other companies you need to allocate resources to innovation. Strategy should define the portfolio of innovation projects that you need to do – both incremental and those that fuel the creation of new growth to sustain the company over the long haul. Then you must allocate resources to those innovation projects. If those longer-term projects don't get funded then, by definition, the reality is that your company is running a short-term, improve-the-core kind of strategy, whether you want to or not. VB: If you don't allocate resources it's just rhetoric compared to things being done. Without resource allocations, you can envision something but it won't be implemented. VB: "…customers don't really buy products; they hire them to get jobs done." "The simple ["why"] question can illuminate more fundamental jobs to be done." Why? Mark Johnson: From the job perspective customers have fundamental problems they're trying to solve, or they have social and emotional needs that they want fulfilled. The customers really don't care what product or service delivers on those needs. Deep down customers are focused on what they are trying to get done in their lives, and maybe at the next level what experiences they want to have in trying to get those jobs done. Where the "why?" question comes in is when you're trying to determine what the fundamental job is. Asking somebody, "Why are you doing this?" and then, "Why did you answer it that way?" and continuing to ask why questions gets at the essence of somebody's job to be done. It allows you to get beyond framing the innovation idea in terms of product attributes, and enables you to think about the idea at its more fundamental level. It's like the classic management technique of the "Five Why's." If you want to get at the root cause, ask 'why' five times. The jobs-to-be-done focus is intended to get at the root reasons of why customers would buy a product in the first place. What they are really doing is, essentially, hiring a product or service to get a job done. The five 'why's helps you understand this more fundamental issue. VB: The jobs-to-be-done model seems equally suitable for innovating products and services to sell in the business to business sphere. Is that true? Mark Johnson: Absolutely. A business selling to another business needs to understand what jobs its business customers need to get done. The Five Whys can help in this context equally well; it is this kind of thinking that allows you to truly be innovative. VB: "…finding ways to connect with nonconsumers is one of the best methods for internal innovators to position disruption as an opportunity instead of a threat." Connecting with "nonconsumers" seems to be a major challenge; do you agree? Mark Johnson: It is, because in many disruptive situations having nonconsumers means that a market doesn't exist yet. The challenge companies have with non-existing markets is that they can't be analyzed. There's no past data about them. This makes it difficult for the marketing and the finance organizations to feel good about developing products for the new market. Take, for instance, the classic example of mini computers, which were disrupted by personal computers. Personal computers were sold to people who previously were not in the computer market. Consumers in homes and in schools had no computing power – they either used a slide rule or a calculator. So for this entirely new home computer or school computer market, there was no data. There was nothing to help determine how the personal computer revolution would unfold. In this situation, Digital Equipment Corp. had difficulty trying to allocate resources to this potentially disruptive innovation, which was initially so small compared to its established corporate computing market. The data indicating future growth was clear and positive in the corporate computing market. By comparison, there wasn't available data to determine what these nonconsumers – these individual folks who were working from home or in schools – would actually do with this technology. Whether or not they would adopt it as a major innovation that would help them do a job they needed to do. VB: Not being able to identify the nonconsumers must make it difficult to identify the jobs they need to get done. Mark Johnson: Yes, that's why when you target a group or segment of nonconsumers because you think you might be able to help, you need to do some research. You can question some of these nonconsumers at the core level about what they are trying to get done. With this understanding you will be in a better position to build a value proposition that's going to be beneficial to them. VB: 'Always be wary of the mantra, "If we build it, they will come."' Would you talk about this? Mark Johnson: This is not just a warning about not being product oriented. More fundamentally, even after you have a good understanding of a fundamental job to be done, you really can't know a priori, whether the offering, product, or service you develop will absolutely be on target. To find out, you need a manageable process for experimentation and the ability to manage risk. So we espouse that you start small. Start with a low cost business model, and a basic offering that you can test in a small, but hopefully representative foothold market. This will enable you to learn and adjust according to what you learn. This approach is far, far more effective – and infinitely less risky – than trying to put out a perfect product or service from the start in its full glory, rolling it out to an entire market. You might find out that 90% of the nonconsumers aren't interested in it or, if they are, that you didn't get one or another vital aspect of the product or the business model right. It's better to test prototypes in the market, and make the necessary adjustments as you find out how they're received than to work behind the scenes with R&D and engineers, build it, and find out that you were wrong. You need what we call transactional testing to figure things out before you plunge in with a full blown commitment to full implementation. VB: "At the heart of the disruptive innovation model is the concept of overshooting, that is, providing too much performance for a given group of customers." Do you find that many people in the business world have difficulty with the thought that "good enough can be great?" It is the nature of corporations to try to one-up the competition. Also, it's natural for them to seek to serve their best customers – they are, after all, the ones that represent not only the highest margins but also the greatest challenges to engineering, product development, and marketing organizations. Many companies – especially engineer-driven ones – have great difficulty with the concept that 'good enough can be great.' They won't find disruptive innovations to elegant or exciting solutions. And that doesn't feel good when you're trying to go neck-to-neck with the competition. It doesn't feel good to the finance people, either, because they've built a certain cost-structure into the way they think about the economics of the business. The notion of going to market with offerings at lower margins, even if revenues will come from a much higher volume, is oftentimes hard for the finance people to compute. Marketing and business development people have their sights on the competition. The finance people are running the numbers. And the production people and engineers are saying this is a substandard way of doing things. In other words, everyone feels uncomfortable. Mark Johnson: Yes, and companies naturally want to go up-market to try to improve their operations and financials. Going down market just doesn't feel good. VB: "Successful disruptors almost never seek a head-on collision with established competitors." Why? Mark Johnson: Research shows that start-ups rarely win against incumbents in head-to-head competition. They can't match the superior resources and market knowledge of established players that are highly motivated to protect their core. That's why the essence of the disruptive innovation approach is that it provides what we call asymmetry of motivation for established competitors. When a disruptive entrant enters the market with a simpler, more accessible, and cheaper offering, established competitors will cede the unattractive low-margin end of the market without a fight. Established competitors don't mind losing their low-profit customers, which in the short run actually raises their profitability as they reorient resources toward the higher end. Alternatively, a disruptive entrant may start in a market too small to matter to a larger, established player. That's how personal computer makers initially began. Such markets aren't interesting to the existing competitors because they don't appear to provide the growth rates and margins needed by the core. So the disruptive approach of starting simple with a low-cost business model and working your way up from market to market is unattractive for the established large corporation that needs to meet large numbers for growth. VB: Implementing new growth ideas can be a significant challenge for companies, even if they're not disruptive innovations. Mark Johnson: We often say that coming up with the ideas isn't the most difficult part. The real challenge is to keep those ideas alive through the resource allocation process. Far too many great ideas simply lose out to the core, starved for resources before they have a chance to take root. VB: 'Follow the mantra, "Adequate in the short term, superior in the long term."' Would you talk about this? Mark Johnson: This is the idea of starting simple and developing the idea in a foothold market with an initial customer. Disruptive ideas should start with low-cost business models, and then add features and functions to the product or service over time. It's much easier to build in costs over time than to take them out of the product after it's introduced to the marketplace. You want the product or the approach to be adequate – to be good enough for your initial market and your initial customers. If things go well, and you can continue to build the market and move up to more demanding customers, you will be able to adapt and build a superior offering for the long haul. A simple example would be eBay. Its founder, Pierre Omidyar, started by selling candy toys called Pez dispensers for his wife. All he wanted to do at that point was to conduct a transaction exchange over the Internet. The initial business was very simple and adequate for its core market niche. In the long haul, eBay became a transformation power house, but it didn't get there overnight. VB: You use the concept "schools of experience." Why is this important for disruptive innovation projects? Mark Johnson: Very simply, people tend to do what they're familiar with doing, what they learned to do in their previous jobs. So it's a lot to expect of people whose whole experience is with well-defined offerings sold in well-defined ways to be comfortable dealing with the ambiguity of starting a new business from scratch and dealing with markets that have yet to be formed. For that, you want to find people who have already had some experience dealing with ambiguous situations. The theory goes back to a gentleman named Morgan McCall Jr. who wrote the book called High Flyers: Developing the Next Generation of Leaders. He said that building that next generation is not about identifying innate talent; what's more important is that managers have the right schools of experience. They've got to have the right past tense verbs on their resumes, and certainly this applies somewhat to disruptive innovation. For disruptive projects to be successful, you can't just take people who were stars at running the core business and put them in charge. You want to mix some existing employees from the core who are doing well with some people who have had entrepreneurial experience. Without the benefit of people seasoned with entrepreneurial abilities, you run the risk of invoking the Peter Principle. VB: Would the definition of disruptive innovation be different for each company? Mark Johnson: Disruptive innovation should be fundamentally the same for each company. The way it's applied will be different, but disruptive innovation should always be about identifying customers that are overshot in terms of what is available from the products in the marketplace, and meeting their lower need. Or identifying potential new customers that are not currently consuming because what they need is to have something made more affordable, accessible, or simple for them. VB: You are Chairman and, together with Clayton Christensen, cofounder of Innosight. What are the innovation consulting services Innosight offers? Mark Johnson: I co-founded the firm with Clay Christensen in 2000. The focus back then was to make the ideas contained in The Innovator's Dilemma practical for large and small companies, alike, so they could apply them effectively. Our collaborations with the companies we have worked with have evolved, and the service we now offer is, essentially, to help them figure out how to create new business growth. We work with companies to develop their existing business. We also work with them to implement a repeatable process both for developing new products and services, and, more fundamentally, for creating new growth capabilities through innovation. This new growth will allow them to go into whole new markets, and to create new business models. The nature of our work with our clients is first and foremost to build a common language about disruptive innovation. In order to make the process of innovation a reality, we also help them implement the tools and supporting elements that are involved. So the focus of Innosight is how to make the process of innovation a much more predictable discipline. VB: Is Clay Christensen still actively involved in Innosight? Mark Johnson: Yes, but primarily he's involved with us from an intellectual point of view. We collaborate on the further development of our existing ideas, and on developing new ideas for specific clients. VB: Are most of your clients involved in putting disruptive innovation to work? Mark Johnson: Most are applying disruptive innovation as part of their strategy to increase the predictability of their success in creating growth. When you really are trying to create new growth – I mean truly new growth in a whole new area – the best way to go into new markets and to transform existing ones is to do it in a disruptive way with a disruptive strategy. VB: Do clients in some cultures or countries get the importance of disruptive innovation more readily than others? Mark Johnson: Yes, I think so. People in India have, more than once, suggested to me that the Hindu religion and culture are particularly receptive to the idea that the old gives way to the new through a process of disruption, reinvention, and renewal. So I think that many business people in India are hungrier than many of their counterparts I have seen in other countries to work with and embrace these ideas. Of course, their situation as a developing country lends itself to this as well. We've done work with Singapore from a different angle. They certainly get the importance of disruptive innovation; they have a voracious appetite for the latest management thinking, and have embraced the idea of disruptive innovation. In fact they have Clay Christensen on their government advisory board. Singapore has embraced disruptive innovation to the extent that, just like much of what they do, the government has identified it as a top-down initiative. I think collectively they 'get it' more than other countries. From a corporate culture point of view, my experience has been that companies that are market-facing tend to depend on deeply understanding the market and their customers, and consumers in general. These companies are more readily capable of conceiving and implementing disruptive ideas. Of course, that's a very broad generalization, but it's what we've observed. VB: Speaking of generalities, is this the case with companies focusing on consumer goods and services more so than business to business companies? Mark Johnson: Yes, in general I think it is easier for a business focusing on the needs of consumers to see the advantages of disruptive innovation. Though there are some companies that get the benefits of disruptive innovation as soon as they understand it can help them deal with dramatic and rapid changes in the business to business space. So there are some business to business companies which recognize that doing things differently and disruptively is part of the evolution of their industry. Also those B2B companies that look not just to their business customers, but also to their customers' customers, will be more likely oriented toward disruption. It is just as important for business to business companies whether they recognize it or not. VB: Do you have any additional advice about how to put disruptive innovation to work? Mark Johnson: Yes. I would summarize the key to disruptive innovation by saying you have to have a language and understand how disruptive innovations compare with sustaining innovation. Second, the new growth that disruptive innovation can bring doesn't happen overnight, and it starts small. So don't try to get the whole organization doing disruptive innovation. To begin with, in fact, it's best to develop some demonstration projects, just to prove the validity of the disruptive approach. Third, for the long term the corporation has to be open to changing some of its innovation processes to accommodate the right way to develop and apply a disruptive approach. VB: It has been a delight to talk to you about this important topic of disruptive innovation. Thank you. Companies that focus only on their best – and often most demanding – customers, end up producing products and services that are too good for mainstream customers. This "overshooting" creates opportunities for companies with simple, inexpensive business models to disrupt the market. Markets should be segmented on the basis of jobs customers want to get done, not according to product or attributes of potential customers such as age, gender, marital status, geographical location, or income level. Companies often miss opportunities for growth because they misunderstand what is their core competency. The Innovator's Guide to Growth provides a wealth of information about how to implement disruptive innovation, and therefore develop new markets. It is a great companion to Clayton Christensen's The Innovator's Dilemma and The Innovator's Solution. It's also useful to read it in conjunction with Seizing the White Space, which will be the focus of our interview with Mark Johnson in next week's IdeaConnection newsletter. 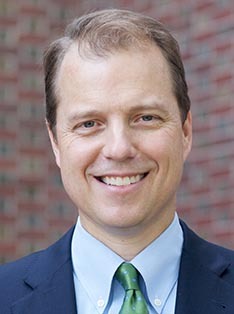 Mark Johnson is chairman of Innosight, a strategic innovation, consulting, and investing company with offices in Massachusetts, Singapore, and India, which he cofounded with Harvard Business School professor Clayton M. Christensen. He has consulted to the Global 1000 and start-up companies in a wide range of industries – including health care, aerospace and defense, enterprise IT, energy, automotive, and consumer packaged goods – and has advised Singapore's government on innovation and entrepreneurship. Prior to cofounding Innosight, Mark Johnson was a consultant at Booz Allen Hamilton, where he advised clients on managing innovation and implementing comprehensive change programs. Before that, he served as a nuclear power–trained surface warfare officer in the U.S. Navy.